It’s time for our 2019 Easter giveaway, and we’re going big this year! Enter for a chance to win a Giant Chocolate Easter Egg or a yummy Easter Bunny Box. Simply leave a comment via our competition widget below saying what prize you would like to win and why. Take a look at our two prizes below to see which one takes your fancy! This truly eggnormous treat is handcrafted by the finest chocolatiers. 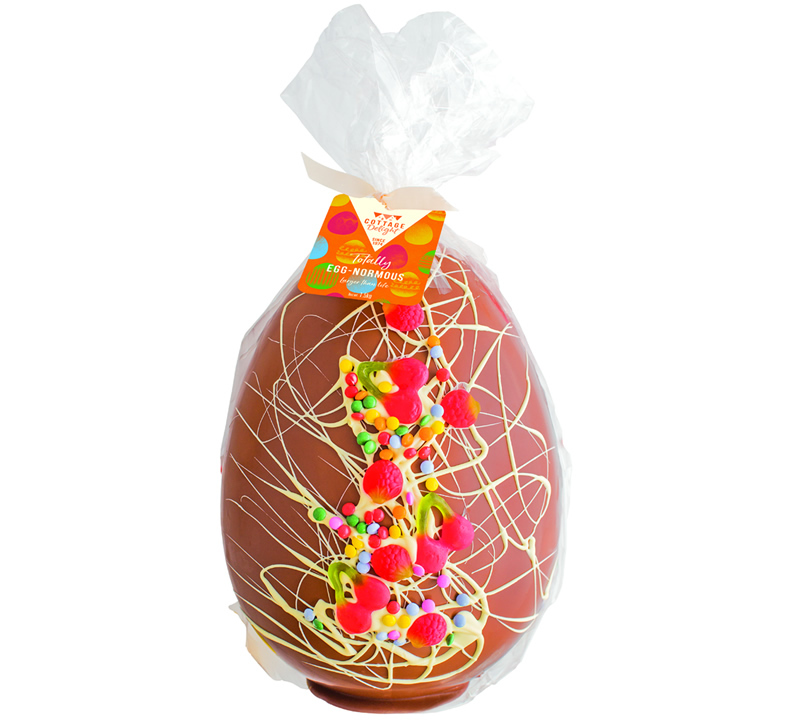 Made with luxurious Belgian chocolate, this impressive egg is drizzled with white chocolate, candy sweets and cherry flavoured gummy sweets. Weighing a whopping 1.5 kg, it might stand out a bit too much in an Easter egg hunt, so probably best to enjoy it indoors while everyone else is outside! Our Easter bunny box is brimming with all kinds of premium Easter treats. Indulge your taste buds in treats like a delicious Lindt chocolate bunny, Hampergifts mini chocolate eggs and moreish cookies. Nestled inside is a milk chocolate Easter egg. You’ll love the rich fruitcake and chocolate coated Turkish delights too! Enter via the Gleam widget below. The competition will close at 1 pm on Monday 15th April 2019. One winner will be selected per prize and contacted via the email address they provided. 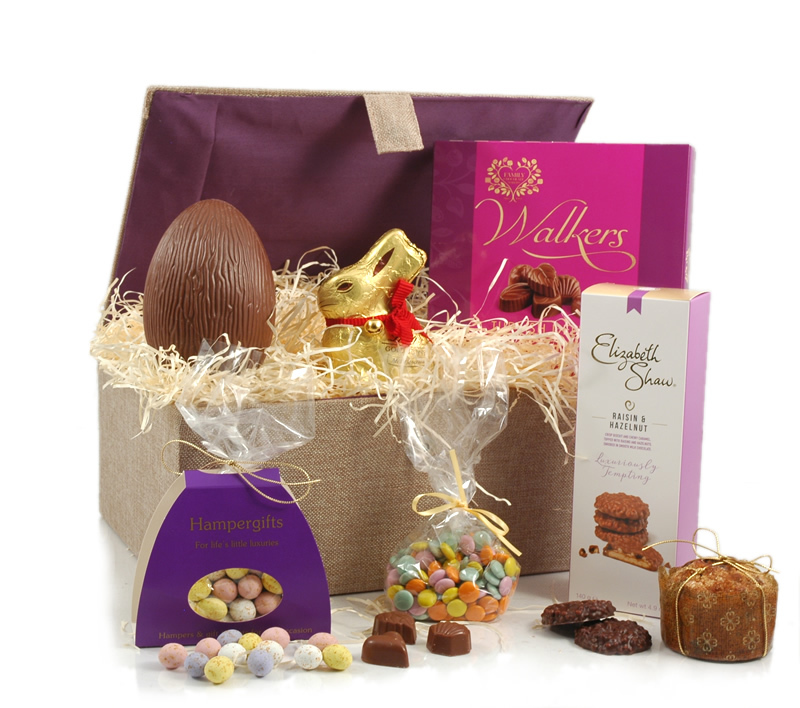 Easter Bunny Box would be perfect for sharing – aren’t I kind? LOL! The Easter Bunny Box! More to share. Would love Prize 2: Giant Chocolate Easter Egg i’ve never had one this time. Gave up chocolate for Lent so my mouth is watering looking at all this lovely chocolate! Oops in my excitement of all this chocolate I forgot to say which prize I would like to win – well any with chocolate of course but if I had to choose maybe that giant Easter egg! I would love to win the Easter Bunny Box as I know lots of little hands that would love to rummage round and pull out a goodie or 2! I’d love to win the Easter Bunny Box to share with my family! I’d love to win the giant easter egg as it looks absolutely amazing. I,d love to win the Easter Bunny Box to share amongst my great-nephew & great-nieces.They all love Easter & chocolate! Either would be great. However the Bunny Box has a little something for all my family of chocoholics! I’d love to win the Giant Egg, to share with the family. I would be over the moon to win either of these. 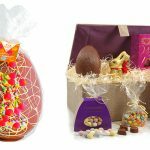 The bunny box offers great variey, the giant egg a huge amount of quality chocolate. After a lot of thought, I would choose the giant chocolate easter egg, as I think t would be my granddaughters favourite. This would be a great prize to win and share with all my Dinner Lady Colleagues. They never get any thanks so this would be an ideal pressie to share with them. The Bunny Easter box here. We’re a bit bonkers about Turkish Delight! would love the Lindt Gold Bunny – my daughter can’t claim this one as hers then! I would love to win the Easter Bunny Box because it contains something for everybody. I would love to win the easter bunny box to share with my husband and 3 children under 5! 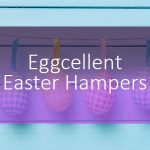 The Easter Bunny Box – there’s something there for everyone! I would love the Easter Bunny box as something for the whole family and easier to share. 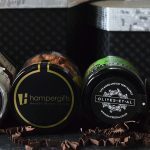 Easter Bunny Box – looks to amazing, lots of treats to last ages, and to share of course. I would love the Easter Bunny Box. 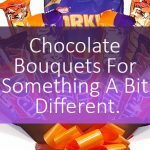 It would be great for sharing with the ever-growing family, who all seem to love chocolate treats! I would choose the Easter Bunny Box as lots to share around although that egg is a thing of beauty.-too good to break up and eat. Prize two The giant Easter Egg sounds amazing I would hand it around the family after Easter Dinner lovely treat. I would love to win prize 1, the Easter bunny box as I have four kids and this would be a great treat for them to share. Easier to divide than the giant egg although that sounds delicious too! I’d love to win this for my wife. Shame she’s on a diet though. The giant easter egg, because it is so unusual and I would love to share it with my family. The Giant Chocolate Easter Egg because it is just such a tour de force. Would love to win the EASTER BUNNY BOX and then I can share with the family. What a lovely giveaway. Thank you very much for the chance. Lindt Gold Bunny – Milk Chocolate! I’d prefer the Easter Bunny box as there’s a lovely mix of products that would be a real family treat at Easter. I love the Giant Easter Egg because it looks, beautiful and my granddaughter would love it. I would love to win the Giant egg as it looks amazing. The box looks better for sharing, that is what Easter is about! Mini Speckled Easter Eggs look delicious! Easter Bunny Box looks like an exciting family treat. There’s something for everyone. 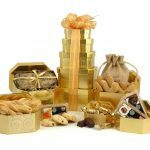 From chocolate eggs and moreish cookies to rich fruitcake and chocolate coated Turkish delights, wow! A PERFECT Easter treat. The Giant Chocolate Egg – my children would be impressed by so much chocolate! Would be great to share it as a family. I would love to win the Easter Bunny Box. Having given it a lot of thought, it would just have to be then Giant Egg. Yum, Yum. I’ve never had a Giant Egg before so I’d love to win one for us all to break up together. Fun! They both look wonderful…but the Easter bunny box I think! I’m greedy – although the Easter bunny box would be better to share with the family, I’d love to win the giant Easter egg! I dream about receiving an egg as beautiful as this every year! I’d like the Easter Bunny Box, would be a fab gift for mum & dad. I’d love to win the Lindt Gold Bunny because it would be a wonderful treat that I’d never buy myself! The Easter bunny box as it would (hopefully) last longer and has a variety of goodies to try! I’d love to win the Giant Easter Egg for my husband. He works so hard to support us and thoroughly deserves a treat! The Easter bunny box would be great for my children. The Easter Bunny Box so I could share with my family. I’d love to win the Lindt Gold Bunny as they’re my favourite! I’d love to win the giant Easter egg so we can crack it open and all share it. I’d love to win the giant Easter egg, it would be amazing to share with the family! The giant egg – A traditional Easter gift, but with the giant size giving it added excitement. I’d love to win the giant egg, my daughter’s face would be a picture! would love win so I could share this with my partner and his wee girls! wow. amazing prizes. good luck everyone! The Easter bunny hamper would be brilliant. Great for sharing with my family. Either would be lovely to win. The giant chocolate egg would be great to give to someone special. It would have to be the Easter Bunny box so me and my family can share (or fight over….) the contents! The Giant Chocolate Easter Egg. It looks amazing! The bunny box would absolutely make my 5yr old daughters day…..year in fact! She loves bunnies and has said she will have no chocolate this Easter if she could have a real rabbit instead. Whilst I would love the giant egg for myself I think the family would love Prize 1: Easter Bunny Box as something in there for everyone! Easter Bunny Box as lots of yummy goodies to share with the family. I would choose the Giant Easter Egg because my son’s eyes would almost pop out when I presented him with it! I’d love the Easter bunny box to share with my family. Hard choice, but will go for the Easter bunny box. I like variety, plus can share with my Mum. If lucky I’d love the Giant egg, chocolate seems to taste so much better in egg form so that must taste amazing!! A toffee hammer and The Giant Easter Egg would make an eggcellent easter treat. The Easter Bunny box would be fabulous for sharing. I’d love the Easter Bunny Box. It would be lovely to have a fabulous chocolate selection that everyone could have a piece of to take away after Easter visits. The Easter Bunny box looks amazing! I think that it would have to be the Easter bunny box. I would love to share this with my boys, they would be delighted. Oh easter Egg all yummy just for me . I’d love to win prize 1 so that I could share the love! 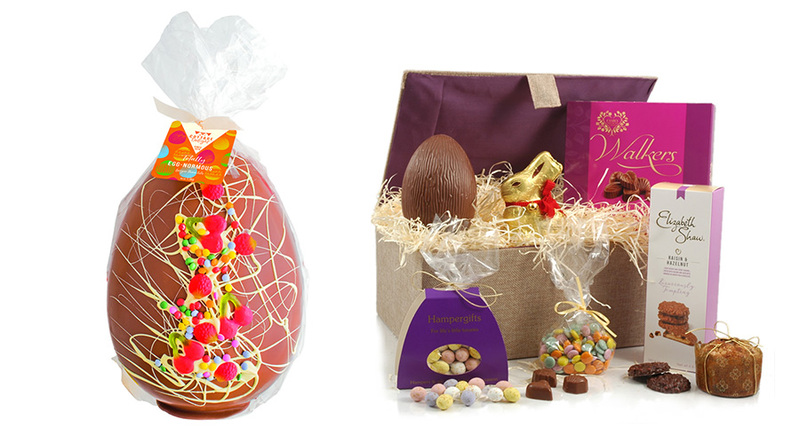 The Giant Easter Egg would be my choice – it looks soooo good! The giant chocolate egg looks amazing! Both are lovely but I would pick the Giant Easter Egg! The Giant Easter egg is amazing! My stepson would absolutely love this! They both look amazing but I would love to win the Giant Chocolate Egg because I love chocolate eggs at Easter and this one looks delicious! The Easter Bunny box as I like the variety of chocolate items in it. Because this looks amazing and is something all my family could enjoy and share! I would love to try the Easter Bunny Box because it has a selection of treats I have never tried! They both look amazing but I’d choose the giant egg as I think it would really wow the family this Easter. Oooh the box of goodies, theres less chance of me eating that in one sitting. I’d love to treat myself and my hubby this year, all the kids and grand kids Easter eggs have been bought but it would be nice to think we had a treat too! I would love to win the Easter Bunny Box as I would like to try the Elizabeth Shaw Raisin & Hazelnut Biscuits, they sound delicious. The rest would disappear quite quickly too! The easter bunny box would be amazing…I’m sure they’ll be something in there to keep everyone in my house happy. Bunny Box please to share among my four little ones! The Easter Bunny box because I like the variation . giant egg because I love chocolate!! The Easter bunny box because there is a variety of products to try! Would love the lindt chocolate bunny! Please can I have the Eater bunny box. I have just had an major op and this would really put a smile on my face and my children’s. Would make a fabulous centre piece at our family lunch & be great to share a Belgian chocolate treat with all my family. It looks great! Fingers crossed! I would like the Easter box as I could share this with the family at our Easter get together. Has to be the Lindt Chocolate Bunny. Reminds me of being small and my Dad would always get them for me and my sister. Hi ,this is a whopper ,definitely a share around egg ,or will I? The Easter bunny box because there’s lots of items to try out, and share with others. I would love to win the Easter Bunny Box, as I love fruit cake and would share out the chocs with family. Looks absolutely amazing. The Giant Easter Egg looks great. Giant Chocolate Egg! I love this giveaway! The Giant Chocolate Easter Egg sounds incredible! The Easter Bunny Box, because it is ideal to share. The Easter Bunny Box please so I can share it with my family. I’d choose the Easter Bunny Box, a gift each for my two small grandchildren & the rest to the local food bank. The giant Easter egg is very unique so I’d choose that. The Easter Bunny box would be much easier to share around! What a wonderful opportunity, would love to share these with my supportive family. Who have been wonderful while I have been going through cancer. They deserve a little sweet love. The hand crafted egg looks eggcellent. It would definitely keep the kids quiet for five minutes. The Giant chocolate Easter egg! Yummy please! The Easter Bunny Box looks yummy. My family love speckled choc eggs! I’d love to win prize 2 It’s a cracking prize and big enough to share with my family. 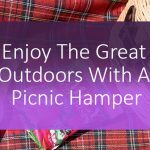 I hope nothing will ‘HAMPER’ me from winning! 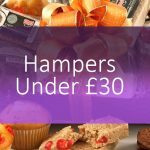 I have a little great grandson who would love this beautiful Easter hamper but would share with the family. I am a real chocoholic and would enjoy the Giant Chocolate Easter Egg or a yummy Easter Bunny Box. Yesterday I ate a 395 gm tasting box of Green and Black chocolates whilst waiting for and travelling on a bus for 25 minutes. I would like to win Prize 2: Giant Chocolate Easter Egg. The grandchildren and the rest of my family would absolutely love your Belgian Hand Crafted Giant Chocolate Easter Egg, It really does look stunning, and almost too good to eat! I would love to win prize 2 of the big Easter egg! It would be amazing to crack it open and share with family. I’d so love to the Giant Chocolate Easter Egg. It would be a great surprise for my kiddies. It looks delicious too. I would love to win the egg, it is so impressive! I always think that easter egg chocolate tastes better than any other chocolate which is silly i know.That is why I would choose the egg. I would love prize 2 please. I’ve never seen an Easter egg this big and it would be great to share with the grandchildren. Wow, I’d love to win the Easter Bunny Box to share with family and friends. It would be a lovely treat to win, thanks for the chance. I’d love to win the Giant chocolate Easter egg as it looks divine, so special and an indulgent treat to share with my loved ones. The Prize 1: Easter Bunny Box, would be my choice. Such a lovely range of treats enclosed . Sounds delicious . I would like to win the Cottage Delight hand crafted large Easter egg please, as it really does look exquisite, i do not treat myself to Belgium chocolate that often plus I would much prefer quality over quantity. I would love the Giant Easter Egg. I’d spend ages just sitting and looking at this thing of beauty, because it’s been a long time since anyone bought me an easter egg. But then, I’d tuck in, sharing pieces with freinds and family of course.